For any queries please see our FAQ section or send email to MalmoAdm@microsoft.com. For technical questions please use the Malmo Forum. How can AI agents learn to recognize someone’s intent (that is, what they are trying to achieve)? How can AI agents learn what behaviors are helpful when working toward a common goal? And, how can they coordinate or communicate with another agent to agree on a shared strategy for problem-solving? While these and other challenges in Collaborative AI remain unsolved, we believe that recent advances have created unique opportunities for finding answers to key questions. That’s the thinking behind the Malmo Collaborative AI Challenge, designed to encourage research relating to various problems in Collaborative AI. The Challenge takes the form of a collaborative mini-game in which players need to work together to achieve a common goal. Challenge participants are invited to develop and train collaborative AI solutions that learn to achieve high scores across a range of partners. Innovative AI solutions to the Challenge can lead to breakthroughs in Collaborative AI technology, and we’d like your help! Are you interested in developing innovative AI solutions? Read how it works! 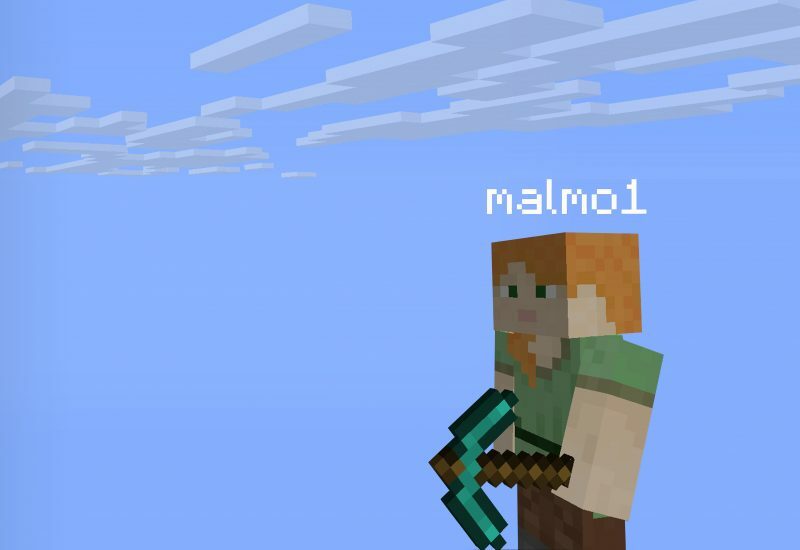 The Malmo Collaborative AI Challenge uses Project Malmo , an artificial intelligence experimentation and research platform that is built on top of the popular Minecraft game. Project Malmo was created to inspire a new generation of research into problems presented by this unique environment. The Malmo Collaborative AI Challenge takes the form of a collaborative mini-game, based on an extension  of the game theoretic “stag hunt.” The stag hunt is a classic example modeling the trade-offs between choosing to collaborate and going solo. We have implemented this concept in the form of the Malmo Pig Chase. The task and sample code are freely available on GitHub. Three winning teams will be awarded placements at the AI Summer School at Microsoft Research Cambridge, UK. During registration, Challenge participants can sign up for either or both prizes. Note that your participation is subject to Challenge Rules (see separate tab on this page). Check the Challenge Rules (see separate tab on this page). Note that the Challenge is targeted at participants affiliated with a university or nonprofit research organization. Form a team (of up to three participants), decide on a team lead, and create a GitHub repository for your submission. Note that you will need to provide a valid link to the GitHub repository at the time of registration. We recommend that you start by creating a fork of https://github.com/Microsoft/malmo-challenge. Decide on whether you want to use Microsoft Azure for developing and training your agent. If you do, note that we will make available, at no charge, Microsoft Azure Passes (market value $1,500 USD) to the first 150 entries (subject to requirements outlined in the Challenge Rules). Please indicate this during registration. Register your team here. Please make sure that your team’s registration form is complete before submitting. Once submitted to Microsoft via your registration form, accepting any changes to your GitHub repository and registration details will be at the sole discretion of Microsoft. Write code and train your agent, who will take the role of one of two players. You can update your submission on your GitHub repository until the entry submission deadline. Before the entry submission deadline, create a one-page summary of your GitHub submission that describes your approach, and create a one-to-three-minute video that shows off your agent. Include the summary and link to the video on your GitHub overview page. After the entry submission deadline, we will assess all Challenge submissions. The best agent is the one who plays best with all other players. Check the winner selection section in the Challenge Rules for further details. We will notify the finalist on June 5, 2017. Before you sign up, please make sure to study the Challenge Rules (see separate tab) carefully. Johnson M., Hofmann K., Hutton T., Bignell D. (2016) The Malmo Platform for Artificial Intelligence Experimentation. Proc. 25th International Joint Conference on Artificial Intelligence, Ed. Kambhampati S., p. 4246. AAAI Press, Palo Alto, California USA. Yoshida, W., Dolan, R.J. and Friston, K.J., (2008) Game Theory of Mind. PLoS Computational Biology, 4 (12), Article e1000254. The Malmo Collaborative AI Challenge (“Challenge”) aims to encourage research in collaborative AI. It takes the form of one or more mini-games in which players need to work together to achieve a goal. Challenge participants are invited to develop and train AI solutions to learn to collaborate to achieve high scores when playing with a range of artificial or human players. Microsoft will make the Challenge tasks and sample code available via GitHub on or before the Challenge start date. Entries will be judged by Microsoft according to the criteria outlined in the “Winner Selection” section below. Microsoft is offering the following prizes: (1) three winning teams will be awarded placements at its AI Summer School at Microsoft Research Cambridge, UK, and (2) three winning teams will be awarded Microsoft Azure for Research grants with a maximum value of $20,000 USD. Please see the “Challenge Prizes” section below for further details. The Challenge starts at 00:01 UK time, on March 14, 2017, and ends at 23:59 UK Time, on May 22, 2017 (“Entry Period”). Entries must be received within the Entry Period to be eligible. Each team member must be enrolled in undergraduate or post-graduate studies (that is, PhD or Masters level) at an accredited college or university and the team lead must be registered in a PhD program at an accredited college or university. In the event that your team includes one or more undergraduates, these individuals will not be allowed to participate in the Microsoft Research AI Summer School should your team be successful in winning this prize. Although teams may include team members from countries other than those within the European Economic Area (EEA) or Switzerland, only team members from countries within the EEA or Switzerland are eligible to attend the Microsoft Research AI Summer School. To be eligible to win the Microsoft Azure for Research Grant prize each team member must meet any criteria that may be imposed by Microsoft to qualify to receive a Microsoft Azure for Research Grant at the time of entry and at the time of award of any prize. Not an immediate family (parent, sibling, spouse/domestic partner, child) or household member of a Microsoft employee, an employee of a Microsoft subsidiary, or any person involved in any part of the administration and execution of this promotion. Subject to meeting the relevant eligibility criteria, teams are permitted to enter to win one or both prizes. Teams will be required to indicate on their registration form which prize(s), if any, they are applying to win. In the event that your team decides that it would like to apply to win a different, or additional, prize, your team lead must notify Microsoft before the end of the Entry Period by sending an email to MalmoAdm@microsoft.com. Only emails actually received by Microsoft before the end of the Entry Period will be considered. This promotion is void where prohibited by law. No purchase necessary. How does my team enter? To participate in the Challenge your team will first need to set up a GitHub repository for your Challenge entry. You will then need to complete a registration form providing certain required information, such as your team name, details of your team members, and a valid link to the GitHub repository that will contain your Challenge entry and submit this to Microsoft via GitHub. Once submitted to Microsoft via your registration form, any changes to your GitHub repository will only be accepted at Microsoft’s sole discretion. Your team can submit its Challenge entry by uploading it to the GitHub location specified on your registration form at any time during the Entry Period. Entries must include all code used to obtain the results submitted by a team and a “Readme” file of no more than 2,500 characters explaining the team’s approach, design decisions and instructions on how to run the submitted code. You will also need to submit a short video (approximately 1–3 minutes) describing your solution. A team may change and/or update its entry at any time before the end of the Entry Period. Only one GitHub entry per team. Teams can choose to make their entry (code on GitHub) publicly available. If they choose to do so, other teams can reuse material from these public entries to improve their submissions. All material taken from these or other sources needs to be clearly labeled as such. Teams are responsible for verifying and honoring any legal requirements that such reuse would entail. If teams choose not to make their entry publicly accessible, we require that access be provided to Microsoft representatives. Detailed instructions will be provided to teams who choose to keep their submissions private. We are not responsible for entries that we do not receive for any reason, or for entries that we receive but are not decipherable for any reason. We will automatically disqualify any incomplete or illegible entries. We will make Microsoft Azure Passes available to the first 150 teams that enter the Challenge and have indicated in their registration form that they wish to be considered to receive a Microsoft Azure Pass and meet the relevant eligibility criteria (including Microsoft verifying that your team’s registration form is complete). A Microsoft Azure Pass has an estimated total market value of $1,500 USD over three months and is limited to a $500 USD usage cap per month. Any additional cost, above this limit, will be charged to the relevant team lead in accordance with standard Microsoft Azure usage rates. Only teams affiliated with a university or nonprofit organization are eligible to receive a Microsoft Azure Pass. The award of Microsoft Azure Passes is also subject to the applicable Azure Pass requirements. Public voting on GitHub (i.e. GitHub “stars”). The judges will give equal weighting to each of the above criteria. The decisions of the judges are final and binding. If we do not receive a sufficient number of entries meeting the entry requirements, we may, at our discretion, select fewer winning teams than available prizes. If any team member is a potential winner and is 18 years of age or older, but is considered a minor in their place of legal residence, we may require that person’s parent or legal guardian to sign all required forms on their behalf. If that person does not complete the required forms as instructed and/or return the required forms within the time period listed on the winner notification message, we may disqualify the relevant team and select a runner-up. Team members will be solely responsible for any taxes that may be payable in connection with the award of any prize. Microsoft Research AI Summer School Placement—Three teams will each be awarded a place at the Microsoft Research AI Summer School at Microsoft Research in Cambridge, UK, between July 3, 2017, and July 6, 2017. Microsoft will reimburse the following reasonably and necessarily incurred travel expenses of team members in attending the AI Summer School: (1) public transport to and from Microsoft Research, Cambridge; and (2) economy class return airfares from your nearest airport to London (only if team members are located outside the UK). Microsoft will also provide accommodation and meals, except for one evening meal, during your placement. Microsoft Azure for Research Grant—Three teams will each win an Azure for Research grant with a maximum value of $20,000 USD. The Azure for Research grant will be awarded to the team lead nominated by the relevant team. Team leads will be solely responsible for allocation of the grant between the relevant team members. The award of a Microsoft Azure for Research grant will be subject to each team member agreeing to comply with such terms and conditions of use or other requirements that Microsoft may impose. What other conditions is my team agreeing to by entering? That, by accepting a prize, Microsoft may use your team name, country of residence, and team photo online and in print, or in any other media, in connection with the Challenge, without payment or compensation to you, except where prohibited by law. How will my team’s entry be potentially used? Except as set out below, we are not claiming any ownership rights to your team’s entry. However, by submitting your entry, each team member: 1. Grants Microsoft an irrevocable, non-exclusive, royalty-free, worldwide right and license to: (i) use, review, assess, test, and otherwise analyze your entry and all its content in connection with the Challenge; and (ii) feature your entry and all content in connection with the marketing, sale, or promotion of the Challenge (including but not limited to internal and external sales meetings, conference presentations, tradeshows, and screen shots of the Challenge entry in press releases) in all media (now known or later developed); and 2. agrees to sign any necessary documentation that may be required for us and our designees to make use of the rights you granted above; and 3. understands and acknowledges that Microsoft may have developed or commissioned materials similar or identical to your team’s submission and you waive any claims you may have resulting from any similarities to your entry; and 4. understands that we cannot control the incoming information you will disclose to our representatives in the course of entering, or what our representatives will remember about your entry. You also understand that we will not restrict work assignments of representatives who have had access to your entry. By entering the Challenge, you agree that use of information in our representatives’ unaided memories in the development or deployment of our products or services does not create liability for us under this agreement or copyright or trade secret law; and 5. understands that you will not receive any compensation or credit for use of your entry, other than what is described in these Challenge Rules. If your team does not want to grant us these rights to your entry, please do not enter the Challenge. What laws govern the way the Challenge is administered? This Challenge is governed by the laws of England and Wales, and you consent to the exclusive jurisdiction and venue of the Courts of England and Wales for any disputes arising out of the Challenge. If someone cheats, or a virus, bug, bot, catastrophic event, or any other unforeseen or unexpected event that cannot be reasonably anticipated or controlled (also referred to as force majeure), affects the fairness and/or integrity of the Challenge, we reserve the right to cancel, change, or suspend the Challenge. This right is reserved whether the event is due to human or technical error. If a solution cannot be found to restore the integrity of the Challenge, we reserve the right to select winning teams from among all eligible entries received before we had to cancel, change, or suspend the Challenge. If any team member attempts to, or we have strong reason to believe that a team member has, compromised the integrity or the legitimate operation of the Challenge by cheating, or through any other illegal, unlawful, or unfair activity, we may seek damages from that team member to the fullest extent permitted by law. Further, we may disqualify your team, and ban any team member from participating in any of our future Challenges, so please play fairly. We will notify winning teams by June 5, 2017. We will also post a leaderboard detailing the top 20 team entries online at https://www.microsoft.com/en-us/research/academic-program/collaborative-ai-challenge/. Please note that we will only post team names and we will not post the names of any individual team members. This list will remain posted for a period of at least 12 calendar months. If your team’s entry is in a public repository we may also post a link to that repository. Please check your GitHub settings to ensure that this will not result in individual team members becoming identifiable, unless this is intended by the individual(s) in question. This promotion is sponsored by Microsoft Research Limited, 21 Station Road, Cambridge, United Kingdom, CB1 2FB. If you believe that Microsoft has not adhered to this statement, please notify us by sending an email to MalmoAdm@microsoft.com or postal mail to Malmo Collaborative AI Challenge, Microsoft Research Limited, 21 Station Road, Cambridge CB1 2FB, United Kingdom, and we will use commercially reasonable efforts to remedy the situation. Please complete the registration form. Before submitting your registration, you will need to set up a repository on GitHub because you will have to provide a valid link during the registration process. Make sure that your team’s registration form is complete before submitting. Once submitted to Microsoft via your registration form, any changes to your GitHub repository and registration details will be accepted at the sole discretion of Microsoft. How should I submit my entry to the Challenge? Your Challenge submission will be the version of the code on your GitHub repository branch master at the time of the entry submission deadline. Your submission needs to contain code in working order and be accompanied by a one-page description of your approach and a link to a one-to-three-minute video that shows off your agent. Do I have to use the example code? The example code is provided as an optional starting point, and you do not need to use it in your submission. However, note that the Challenge task definition cannot be changed. What platforms/languages can I use? Malmo clients can be run on Windows, Linux, and Mac. We also provide ready-to-build Docker images that can be run on any platform supported by docker.io. The Challenge has been developed around Python—both 2.7 and >= 3.4 are compatible. Can I publish results of my experiments with the Malmo Collaborative AI Challenge? Microsoft is offering the following prizes: (1) three winning teams will be awarded placements at its AI Summer School at Microsoft Research Cambridge, UK, and (2) three winning teams will be awarded Microsoft Azure for Research grants with a maximum value of $20,000 USD. Please read the Challenge Rules on this page for further details. You can direct administrative questions to MalmoAdm@microsoft.com. For technical questions, we encourage you to use the Microsoft Malmo forum. We endeavor to respond within two business days. Microsoft Azure is the Microsoft cloud computing service. Azure provides a wide range of services and supports a wide variety of popular platforms, tools and programming languages. It is ideal for deep learning using GPUs and for running machine learning models. As part of the Malmo Collaborative AI Challenge we provide example code for running experiments using Docker on Azure. What is Microsoft Azure for Research? The Microsoft Azure for Research program awards cloud computing time, training, and resources for the purpose of conducting cloud-based research. Qualified applicants must be affiliated with a university or nonprofit research organization. How do I get a free Microsoft Azure Pass? During registration, you’ll be asked “Do you want to use a FREE Microsoft Azure Pass?” If you choose “Yes,” we will contact you within two business days to set this up. Note that these passes are available only to the first 150 entries under the precondition that your team’s registration form is complete and the terms and conditions stated in the Challenge Rules apply. The EEA (European Economic Area) includes EU countries and also Iceland, Liechtenstein, and Norway. The EU countries are: Austria, Belgium, Bulgaria, Croatia, Republic of Cyprus, Czech Republic, Denmark, Estonia, Finland, France, Germany, Greece, Hungary, Ireland, Italy, Latvia, Lithuania, Luxembourg, Malta, Netherlands, Poland, Portugal, Romania, Slovakia, Slovenia, Spain, Sweden, and the UK. How can I sign up for the prizes? During registration, you will be asked whether you wish to apply to win the respective prize. Please answer accordingly. Note that the AI Summer School prize is restricted to participants from EEA countries plus Switzerland and the Azure for Research Grant prize is restricted to participants who are affiliated with a university or nonprofit research organization. Please check the Challenge Rules tab on this page. The judges will give equal weighting to each of the above criteria. The judges will be employees of Microsoft Corporation or one of its affiliated companies. For further details please check the Challenge Rules.